The tomato is a versatile plant that grows well in a container when space is limited. Most tomato varieties will grow in a container, but dwarf or cherry varieties are more suitable as they have a smaller plant size. Place the container on a patio or deck that receives at least eight hours of full sunlight. Tomatoes grown in containers will have low blossom and fruit production if not given adequate water during the growing season. Select a planting container that has drainage holes and a minimum of 12 inches in height and 12 inches in diameter. Set a piece of wire mesh or stones over the drainage holes to prevent soil from leaking out with the water. Mix together equal portions of a high-quality potting soil, perlite and peat moss. Fill the container with the soil mixture. Create a hole in the center of the soil that is approximately 3 inches deeper than the size of the tomato plant's root ball. Set the plant into the hole so the lower leaves of the plant are just above ground level. Cover the root ball and stem with soil. Gently tamp to hold in place. Water the soil until it runs out the bottom drainage holes. Continue to water the container through the growing season to keep the soil moist. Monitor the soil moisture, as the soil will dry out quickly during the summer months. Fertilize the tomato plant with a balanced vegetable fertilizer after the tomatoes have formed to one-quarter their full size. Apply fertilizer three weeks after the first application. Water the soil well after applying fertilizer. Place a tomato cage around the plant to provide support as it grows. Adjust the fruiting branches over the cage to make sure they have support as the tomatoes increase in weight. 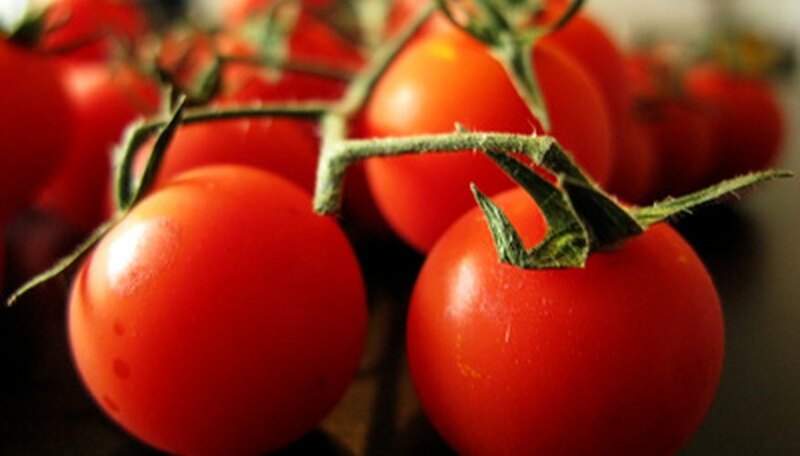 Pick tomatoes when the fruit is fully colored and firm. Allow the fruit to ripen on the vines for best quality.